Click the image to access a photo gallery. Two local restaurants will be serving baked goods created by Plymouth High School culinary students, thanks to new collaborations with industry partners. 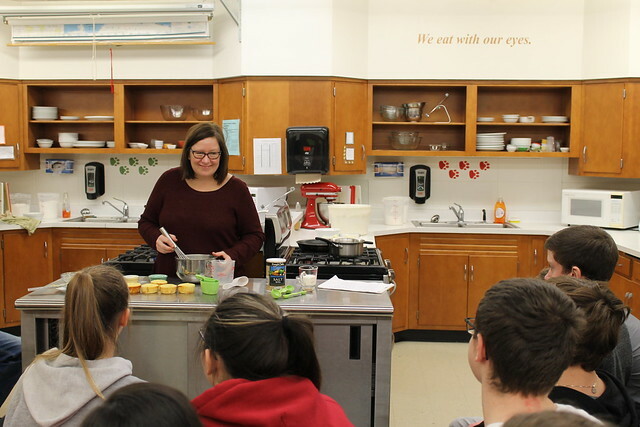 Chef Lynn Chisholm, owner of the Paddock Club in Elkhart Lake, was on hand Jan. 7 to kick off the new Cupcake Challenge to students in Gale Litt’s Culinary Arts 2 (Pastry Chef/Bake Shop) class. Chef Chisholm demonstrated how to fill and frost cupcakes, offering tips and suggestions as she worked. Over the next seven classes, teams of students researched recipes and determined what ingredients they would need. They did a practice round, preparing cupcakes, filling and frosting, and making adjustments. They then prepared the competition cupcakes, which Chef Chisholm judged. The winner was the Vanilla Cupcake with Blueberry Filling topped with a Light Lemon Cream Cheese Frosting created by Gracie Kasuboski, Ella Tesky, Taylor Miller and Anne Sedlacek. Their cupcake will be featured on the Paddock Club menu the week of Valentine’s Day. In second place was the Sweet Potato Cider Cupcakes with Marshmallow Frosting created by Zachary Youmans, Paul McCreedy, Mitch Arnold and Harrison Kruschke. The goal of the project is to demonstrate professional team skills while researching and perfecting a cupcake worthy of restaurant service, Mrs. Litt said. The Cupcake Challenge replaces the cake decorating contest that Culinary Arts 2 classes have done for many years as a culminating project. “I wanted to establish an industry partner instead to make an authentic learning experience,” she explained. The Hub Café sold muffins based on recipes created by PHS students. Students in Culinary Arts 3 (Catering & Careers) had a similar opportunity, in which they developed and baked muffins in conjunction with The Hub Café, located across the street from PHS. The Hub started with the recipes developed by the students, and adjusted for qualities such as larger size and moisture. An initial panel screening favored Peach Struesel, but the fan favorite – the one that sold out first – turned out to be Spiced Chai. This type of collaboration is just one of many ways in which the Plymouth School District partners innovatively with colleges, businesses, and community organizations to create solutions. • The LTC-Plymouth Science & Technology Center was created through a partnership of federal, municipal, LTC, and business sources. • We were the first district in the area to provide 1-to-1 technology, with a laptop for every PHS student since 2010. • We were the first in the state with an in-house master’s degree program, to help our teachers keep learning. • The state Global Studies Certificate is modeled after the one offered at Plymouth High School. • Visit Our Values page to learn more about our emphasis on Comprehensive Education, Innovation & Collaboration, Extracurriculars, and Wellness. Families exploring their options through open enrollment are encouraged to consider the Plymouth School District, which is just the right size to offer personal attention along with a wealth of opportunities. Our mission is to encourage everyone to see and be his/her personal best through successful learning experiences. Become your best! Wisconsin's inter-district public school open enrollment program allows parents of children in kindergarten through 12th grade to apply for their children to attend school districts other than the one in which they reside. There is no tuition cost to parents who opt for open enrollment, though families may be charged the same fees as resident students. Parents are responsible for transportation to and from school. The enrollment period in 2019 is from Monday, Feb. 4 to Tuesday, April 30. The state encourages online applications at http://dpi.wi.gov/open-enrollment. Paper applications, available in the Plymouth School District office, must be returned to the office by April 30. • Visit our Why Plymouth? 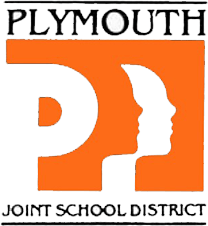 section to further explore what the Plymouth School District offers. • Explore our interactive District Report Card to see how an exciting mix of academics, extracurriculars, and other enriching experiences allow our students to thrive. • Contact the district office at (920) 892-2661 to schedule a visit. • Visit the state’s open enrollment web site at http://dpi.wi.gov/open-enrollment.